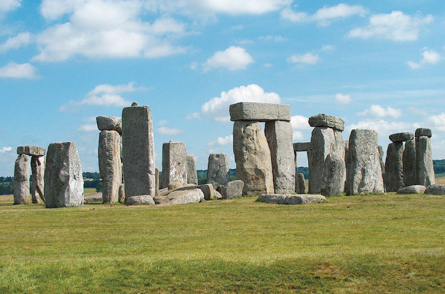 The ancient builders of Stonehenge may have had a surprisingly meaty diet and mobile way of life. Although farming first reached the British Isles around 6,000 years ago, cultivation had given way to animal raising and herding by the time Stonehenge and other massive stone monuments began to dot the landscape, a new study finds. Agriculture’s British debut occurred during a mild, wet period that enabled the introduction of Mediterranean crops such as emmer wheat, barley and grapes, say archaeobotanists Chris Stevens of Wessex Archaeology in Salisbury, England, and Dorian Fuller of University College London. Farming existed at first alongside foraging for wild fruits and nuts and limited cattle raising, but the rapid onset of cool, dry conditions in Britain about 5,300 years ago spurred a move to raising cattle, sheep and pigs, Stevens and Fuller propose in the September Antiquity. With the return of a cultivation-friendly climate about 3,500 years ago, during Britain’s Bronze Age, crop growing came back strong, the scientists contend. Farming villages rapidly replaced a mobile, herding way of life. Many researchers have posited that agriculture either took hold quickly in Britain around 6,000 years ago or steadily rose to prominence by 4,000 years ago. In either case, farmers probably would have assembled Stonehenge, where initial work began as early as 5,500 years ago, with large stones hauled in around 4,400 years ago (SN: 6/21/08, p.13). But if Stevens and Fuller’s scenario of British agriculture’s ancient rise, demise and rebirth holds up, then small groups of roaming pastoralists collaborated to build massive, circular stone and wood structures, including Stonehenge. Shifts from farming to pastoralism, sometimes accompanied by construction of stone monuments, occurred around the same time in parts of Africa and Asia, the researchers say. “Part of the reason why pastoralists built monuments such as Stonehenge lies in the importance of periodic large gatherings for dispersed, mobile groups,” Fuller says. Collective meeting spots allowed different groups to arrange alliance-building marriages, crossbreed herds to boost the animals’ health and genetic diversity and hold ritual feasts. At these locations, large numbers of people could be mobilized for big construction projects, Fuller suggests. “A predominantly pastoralist economy in the third millennium B.C. accords well with available evidence and provides a suitable backdrop to the early development of Stonehenge,” says archaeologist Timothy Darvill of Bournemouth University in England. But he believes many large stones were brought to Stonehenge during a later upswing in cereal cultivation, as pastoralism receded in importance. Stevens and Fuller compiled data on more than 700 cultivated and wild food remains from 198 sites across the British Isles whose ages had been previously calculated by radiocarbon dating. A statistical analysis of these dates and associated climate and environmental trends suggested that agriculture spread rapidly starting 6,000 years ago. About 700 years later, wild foods surged in popularity and cultivated grub became rare. Several new crops — peas, beans and spelt — appeared around 3,500 years ago, when storage pits, granaries and other features of agricultural societies first appeared in Britain, Stevens and Fuller find. An influx of European farmers must have launched a Bronze Age agricultural revolution, they speculate. Stevens and Fuller’s analysis offers only a general breakdown of how farming and pastoralism developed in Britain, asserts archaeologist Alasdair Whittle of Cardiff University in Wales. The scale of cultivation, even during times characterized by relatively abundant remains of domesticated plants, remains uncertain, Whittle says. Even if farmers didn't built Stonehenge, cultivators erected plenty of massive stone monuments, Whittle holds.